The burden of noncommunicable diseases (NCDs) constitutes a significant public health challenge across the globe with the potential to undermine socioeconomic development throughout the world.,, NCDs are the major cause of global mortality, contributing to more than 63% of all-cause mortality., Global burden of disease publications report ischemic heart disease, lower respiratory infections, cerebrovascular disease, low back and neck pain, and road injuries to be the five leading morbidities contributing to disability-adjusted life years by 2013., These are also the major contributors of years lived with disability, especially in aging populations. The burden is expected to escalate further, as the impact of NCDs increases, and as population ages. While global mortality attributable to NCDs was 60% in 1998, it is expected to reach 73% by 2020. The greatest incline is expected to be seen in low- and middle-income regions, which also currently bear the highest burdens., The NCD epidemic also strikes disproportionately among people in lower socioeconomic groups. While poverty pushes families toward adoption of unhealthy lifestyle behavior and practices leading to NCDs, they in turn, due to their chronic nature and immense socioeconomic impact, aggravate poverty. The World Health Organization (WHO) in 2000 in its global strategy for the prevention and control of NCDs provided sound vision and a clear roadmap to prevent and control NCDs and to assist countries in establishing effective programs. United Nations General Assembly in 2011 adopted a political declaration acknowledging the rising burden of NCDs as a major challenge for development in low-middle income countries (LMICs). They also identified NCDs as a threat to global economy and recognized the need for engagement of all sections of society under government leadership to effectively respond to the problem. The 2030 Agenda for Sustainable Development adopted at the United Nations Summit on Sustainable Development in September 2015, recognized NCDs as a major challenge for sustainable development. It was decided to develop national strategies to reduce premature mortality due to NCDs, strengthen responses to reduce the harmful use of alcohol and tobacco, and support the research and development of vaccines and medicines for NCDs. Though much is known about the lifestyle-related risk factors which are linked to the four major NCDs, there are still knowledge gaps that prevent sound public health action., It is important to strengthen research to prioritize health needs, especially in resource-constraint settings. Accurate assessment of the magnitude of the problem in country-specific settings, identification of its causes and development of potential solutions, and implementation research with subsequent impact evaluation of these solutions requires application of rigorous and robust research agenda setting and methodology. Employment of health technology assessment techniques may generate further evidence in favor of solutions that are most cost-effective and least resource intensive. As the impact of NCDs such as hypertension and diabetes is essentially similar in different populations around the world, another priority research need is for operational research in the delivery of care. Another crucial issue currently is the limited research being conducted on chronic NCDs in developing countries, resources for such research being severely limited., One way to employ research resources more efficiently is to identify existing research infrastructures established for other purposes and use them for NCD-related research., This again requires strengthening and orienting national health systems toward high-quality research and development for NCD prevention and control. The other solution is to create awareness among policymakers regarding importance of scientific evidence, who in turn, may enhance investments to facilitate high-quality research for generation of the same, at least for priority research areas in their local context., Considering these research needs, the World NCD Federation (WNF) hosted a plenary session on global research priorities at the 1st World NCD Congress on November 6, 2017, in Chandigarh, India. WNF is a professional association working for global health agenda for universal health care for NCDs. The plenary session was chaired by Shri Ashwini Kumar Choubey, Minister of State for Health and Family Welfare, Government of India and Prof Anne Kelso of National Health and Medical Research Council, Australia, while Dr. Soumya Swaminathan (Global Alliance for Chronic Diseases [GACD] Board Member), Secretary DHR and DG Indian Council of Medical Research, India was the lead speaker. Executive Director and other management committee members (from Belgium, Brazil and United Kingdom) of the GACD  and Director, Center for Health Equity, Melbourne School of Population and Global Health were the panelists in the session. The author in this paper highlights key global research priorities under different NCD domains, summarizing what is currently known and where are the knowledge gaps that need to be worked upon. This has been supplemented with the proceedings of discussions that took place as part of the plenary session. A literature review was performed in October 2017 to identify existing articles and documents discussing research priorities in NCDs. Search terms were developed, and both methodological and topic literature was searched. This involved a review of research papers, published reports, and policy documents to collect information on the current global priorities. PubMed and Google scholar databases were used to search for published literature. The search combined various terms for NCDs and research priorities and combined both free text words and controlled vocabulary terms. No restrictions on publication date were used; however, the language was restricted to English. Reference lists of the included documents were hand searched to identify additional relevant articles and documents. In addition, we searched the websites of governmental entities and international agencies such as WHO, World Bank, and USAID. Each document was reviewed and summarized in a data collection sheet that included title of the document, type, and component (and elements) of the research priorities it addressed. The interaction between chair and the panelists participating in the plenary session conducted in the 1st World NCD Congress was recorded using audio-visual media. Key points emerging from the discussions were noted and summarized for identification of thematic areas. Keeping in perspective the approach followed by WHO, it has been attempted to describe the key priority areas requiring urgent attention in the field of NCD prevention and control. The research themes have been stratified initially as per specific morbidities and their risk factors and then under the cross-cutting domains common to majority of NCDs. These contribute to 48% of NCD deaths and 10% of global disease burden. Vast knowledge base on causes and risk factors of cardiovascular diseases and effective preventive and curative interventions is available. However, country-specific information on extent and patterns of disease and its social impact needs to be identified. Impact of individual-level behavioral factors and societal level factors such as urbanization need to be assessed. Health system-related opportunities related to application of primary and secondary care cost-effective interventions need to be identified and explored. Effectiveness studies on alternative, low-cost, and feasible population screening approaches and community education campaigns in LMIC need to be conducted. Chronic obstructive pulmonary disease (COPD) is expected to be third leading cause of global mortality by the year 2030. Tobacco smoking and indoor air pollution, especially due to use of solid fuels are the common risk factors. Studies collecting empirical data to accurately measure the magnitude of the problem in LMIC, however, are still needed. Furthermore, research on evidence-based approaches for prevention of COPD in primary care settings is required. Studies are also required to assess gaps in accessibility and affordability of essential medicines and technologies required for treatment of Asthma and COPD. Finally, research for development of community-based interventions for behavior change for primary prevention is the need of the hour. Evidence related to cost-effective measures for prevention of diabetic complications is abundant. However, measures toward reduction in diabetes incidence are not available. The prevalence of diabetes, its complications, and risk factors need to be assessed in LMIC settings. Research is also needed to assess the impact of rural-urban migration, changes in traditional food habits, and physical activity patterns in different population subgroups. Cost-effective point of care diagnostic techniques and risk prediction algorithms for vulnerable populations need to be established. Furthermore, research is required to develop risk prevention programs using lifestyle interventions among high-risk populations. Evidence on benefits of controlling exposure to known carcinogens is available. Early detection and screening programs are known to be very cost-effective. Mechanisms to strengthen cancer registries and control programs need to be researched. Community-based approaches for improving awareness about risk factors and early identification need to be developed. Health technology assessment exercises for identifying cost-effective treatment modality combinations need to be conducted. Research is also needed to establish effectiveness and cost-effectiveness of vaccines for prevention of cancers in LMIC settings. Qualitative research toward health system strengthening and policy advocacy mechanisms for enhancing cancer-related service delivery and health-care financing is also required. Since treatment of cancer is usually very costly and mostly borne out of pocket, innovative measures to reduce catastrophic impact of the same on patients and their families need to be developed. Cost-effective measures for prevention and control of NCDs have been established in high income countries; however, mechanisms for their effective utilization in low-income settings have to be generated. Research for identification of sustainable strategies for a comprehensive risk reduction at individual and community level, including behavior management strategies, in diverse cultural settings is required. Studies looking at mechanisms to enhance coverage of primary care service delivery mechanisms and health system infrastructure in resource-poor settings may help in improving primary health-care services for NCDs. Studies are also required to identify culturally specific and appropriate resources for training and skill enhancement of health-care workers. More effective engagement with the private sector under public-private partnership mode in areas with low public health-care sector availability needs to be explored. Furthermore, mechanisms to engage other government departments in partnerships with the health department for prevention of NCDs may be explored. Research to identify effective strategies for improvement of data collection mechanisms for NCD incidence and prevalence is required. Approaches to strengthen the existing health management information systems with reorientation of the same for NCD data collection need to be studied. Better methods to triangulate information from different sources to improve accuracy need to be developed. Similarly, research is required for bringing improvement to the data quality assurance mechanisms. Finally, strategies to build capacity of human resources for health to undertake data analysis, interpret results, and disseminate findings are required to be researched further. Social determinants are understood to play as important a role as the health system in influencing morbidity and mortality patterns in the communities. However, studies to objectively quantify this role and its application in prevention and control of NCDs are still required. This has to be done at a disaggregated level to generate information about all major groups of NCDs in different population subgroups. Studies are also required to understand the impact of social factors on inequalities in NCD outcomes. Factors contributing to NCDs at individual level, household level, and community level including development factors, economic factors, and demographic factors need to be understood within the specific geographical and cultural context of various countries to identify strategies to effectively employ them for reduction of NCD risk factors. Research is required to identify channels to facilitate uptake of scientific evidence for decision-making by policymakers, especially in LMICs. This can be accomplished only by conceptually understanding the research–policy–practice processes currently in place. Research is also required to understand linkage between public health institutions, advocacy groups, and policymaking bodies, and how these can be strengthened and reoriented toward evidence-based decision-making. Research to understand the political realities and power relations between various stakeholders that may hinder research uptake is also required. Research is required to develop frameworks for enhancement of intersectorial coordination and cooperation between different government departments. Studies to understand the dynamics underlining interactions between different government departments and how these dynamics can be modified for public health benefit need to be commissioned. Research should be encouraged to develop mechanisms for incorporation of health policy in all major Government policies for effective NCD prevention. Research studies focusing on identification of means to cultivate and employ responsible media, including social media, encouraging social dialog, and behavior change communication should be conducted. Evidence-informed policies and practices to prevent and control emerging NCD epidemic require scientifically robust research. Although significant steps are being undertaken globally in this direction, there is still a lack of consensus on key research areas that should be focused on first. This study enlisted a set of priority areas and questions which can assist in guiding research aimed at prevention, control, and treatment of NCDs. Studies attempting to assess the magnitude of both the problem itself and its risk factors are the first and topmost priority. There is an urgent need to establish and strengthen both hospital-based and population-based registries for better monitoring and evaluation. A large database exists now on preventive and curative interventions that can be undertaken at different levels, but context-specific studies validating efficacy of these measures in different settings are still required. Also important is to generate cost-effectiveness parameters for these interventions which can better assist policymakers in decision-making. Research looking at ways to integrate these interventions at various levels of the health-care delivery system may contribute significantly to health system strengthening. Socioeconomic, developmental, as well as political factors contributing to NCDs at all levels of society, be it individual, household, or community level, need to be recognized and comprehended within the specific geographical contexts of various countries. Research is also required to understand mechanisms to facilitate uptake of scientific evidence for decision-making by policymakers. Low investments and funding toward NCD-related research is a harsh reality. Research on advocacy mechanisms to attract more funding by convincing policymakers in national governments of different countries and international donor agencies will go a long way to tackle NCDs by bringing them on the center stage of the health and health-related policies. To conclude, most of the current global research to prevent and control emerging NCD epidemic is specific to certain morbidities and contextual areas of interest to various stakeholders. It is important to generate knowledge and help to translate this knowledge into action, through innovative approaches both for the factors that are well understood as well as the ones for which there are lacunae in our current understanding. Multidisciplinary research approaches need to be followed to better elucidate the influence of sociodemographic and economic factors on NCD prevention and control, to enhance availability and accessibility of cost-effective interventions to lower socioeconomic strata, and to increase the uptake of evidence-based research for policy development by policymakers, especially in LMICs. Shri Ashwini Kumar Choubey, Minister of State for Health and Family Welfare, Government of India and Prof Anne Kelso (Chair Elect), National Health and Medical Research Council, Australia. Earnest thanks are also due to the lead speaker, Dr Soumya Swaminathan (GACD Board Member), Secretary DHR and DG ICMR, India and panelists in the session, Dr Karim Berkouk (GACD Management Committee Chair), Deputy Head NCDs and Challenges of Healthy Aging, Research Directorate, European Commission, Belgium, Dr Fernando Cendes (GACD Management Committee Member), FCM-UNICAMP, Brazil, Dr. Celina Gorre, Executive Director, GACD, United Kingdom and Dr. Brian Oldenburg, Professor and Director, Centre for Health Equity, Melbourne School of Population and Global Health, Australia. Global Action Plan for the Prevention and Control of Noncommunicable Diseases 2013-2020. Geneva: World Health Organization; 2013. Bloom DE, Cafiero ET, Jané-Llopis E, Abrahams-Gessel S, Bloom LR, Fathima S, et al. The Global Economic Burden of Non-communicable Diseases. Geneva: World Economic Forum; 2011. Draft Action Plan for the Prevention and Control of Noncommunicable Diseases 2013–2020. Report by the Secretariat. A66/9 WHO 66th World Health Assembly; 2013. Global Status Report on Noncommunicable Diseases 2010. Geneva: World Health Organization; 2010. The Growing Danger of Non-Communicable Diseases: Acting Now to Reverse Course. Washington DC: The World Bank; 2011. Vos T, Barber RM, Bell B, Bertozzi-Villa A, Biryukov S, Bolliger I, et al. Global, regional, and national incidence, prevalence, and years lived with disability for 301 acute and chronic diseases and injuries in 188 countries, 1990-2013: A systematic analysis for the Global Burden of Disease Study 2013. Lancet 2015;386:743-800. Global Strategy for the Prevention and Control of NCDs A53/14. Geneva: World Health Organization; 2000. Nikolic IA, Stanciole AE, Zaydman M. Chronic Emergency: Why NCDs Matter. Health, Nutrition and Population (HNP) Discussion Paper. Washington DC: The World Bank; 2011. Mendis S, Alwan A, editors. Prioritized Research Agenda for Prevention and Control of Noncommunicable Diseases. Geneva: World Health Organization; 2011. Boutayeb A, Boutayeb S. The burden of non communicable diseases in developing countries. Int J Equity Health 2005;4:2. Bloom DE, Cafiero-Fonseca ET, Candeias V, Adashi E, Bloom L, Gurfein L, et al. Economics of Non-Communicable Diseases in India: The Costs and Returns on Investment of Interventions to Promote Healthy Living and Prevent, Treat and Manage NCDs. Geneva: World Economic Forum, Harvard School of Public Health; 2014. Political Declaration of the High-level Meeting of the General Assembly on the Prevention and Control of Non-communicable Diseases. A/RES/66/2 United Nations General Assembly; 2012. Health in 2015: from MDGs, Millennium Development Goals to SDGs, Sustainable Development Goals. France: World Health Organization; 2015. From Burden to “Best Buys”: Reducing the Economic Impact of Non-Communicable Diseases in Low- and Middle-Income Countries. Geneva: World Economic Forum; 2011. World Health Organization. Scaling up Action Against Noncommunicable Diseases: How Much Will it Cost? France: World Health Organization; 2011. Zachariah R, Ford N, Maher D, Bissell K, Van den Bergh R, van den Boogaard W, et al. Is operational research delivering the goods? The journey to success in low-income countries. Lancet Infect Dis 2012;12:415-21. World Health Organization. Stop the Global Epidemic of Chronic Disease: A Practical Guide to Successful Advocacy. Geneva: World Health Organization; 2006. Sturke R, Vorkoper S, Duncan K, Levintova M, Parascondola M. Addressing NCDs through research and capacity building in LMICs: Lessons learned from tobacco control. Glob Health Action 2016;9:32407. Maher D, Sekajugo J. Research on health transition in Africa: Time for action. Health Res Policy Syst 2011;9:5. Lavis JN. How can we support the use of systematic reviews in policymaking? PLoS Med 2009;6:e1000141. Goyet S, Touch S, Ir P, SamAn S, Fassier T, Frutos R, et al. Gaps between research and public health priorities in low income countries: Evidence from a systematic literature review focused on cambodia. Implement Sci 2015;10:32. World NCD Federation; 2017. Available from: http://www.worldncdfederation.org/about/. [Last accessed on 2017 Dec 18]. 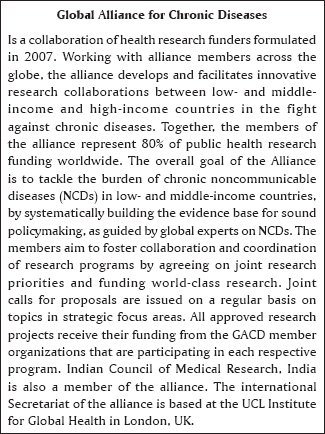 Global Alliance for Chronic Diseases; 2017. Available from: https://www.gacd.org/about. [Last accessed on 2017 Dec 18]. Howson CP, Reddy KS, Ryan TJ, Bale JR, editors. Control of Cardiovascular Diseases in Developing Countries: Research, Development, and Institutional Strengthening. Washington DC: Committee on Research, Development, and Institutional Strengthening for Control of Cardiovascular Diseases in Developing Countries, Institute of Medicine; 1998. Mathur P, Shah B. Research priorities for prevention and control of noncommunicable diseases in India. Indian J Community Med 2011;36:S72-7. Thakur JS, Jeet G. Burden of non communicable diseases: Mortality, morbidity and trends. In: Thakur JS, editor. Public Health Approaches to Non Communicable Diseases. 1st ed. New Delhi: Wolters Kluwer Publishers; 2016. Ruby A, Knight A, Perel P, Blanchet K, Roberts B. The effectiveness of interventions for non-communicable diseases in humanitarian crises: A Systematic review. PLoS One 2015;10:e0138303. Ortegón M, Lim S, Chisholm D, Mendis S. Cost effectiveness of strategies to combat cardiovascular disease, diabetes, and tobacco use in sub-saharan africa and south east asia: Mathematical modelling study. BMJ 2012;344:e607. Thakur JS, Grover A, Tripathy JP. Prioritised research agenda for NCDs. In: Thakur JS, editor. Public Health Approaches to Non Communicable Diseases. 1st ed. New Delhi: Wolters Kluwer Publishers; 2016. Noncommunicable Diseases and Their Risk Factors: ECOSOC's Latest Task Force Resolution Calls for More Investment in NCDs; 2017. Available from: http://www.who.int/ncds/un-task-force/events/ecosoc-report-2017/en/. [Last accessed on 2017 Dec 18].